Pelco by Schneider Electric has announced that its Esprit Series integrated positioning system is now available in IP and HD with the new Esprit HD Series IP Positioning System. The Esprit HD provides users with live streaming of images over the Internet using a standard web browser and delivers on the industry’s need for performance and image quality in all settings, including rugged environments. Integrated Analytics Suite: Built-in analytics suite enhances the flexibility and performance of the Esprit HD. The system comes standard with nine preloaded Pelco behaviours to detect any potential threats caught on camera and can be configured and enabled using a standard web browser. Pelco analytic tools can sound an alarm to notify system operators of unusual activity and are compatible with Endura and other third-party systems that support alarms using Pelco’s API. User-Defined Customisation: Through built-in analytic tools, the Esprit HD can be programmed with multiple Pelco behaviours and scheduled to work within predetermined times or conditions specific to a business’ needs. For example, a camera can be configured with “Object Counting” to count the number of people that enter a lobby door throughout the day, then adjusted in the evening to detect “Camera Sabotage” to trigger an alarm if a camera is moved or obstructed. Additional customisation is available through settings, such as “Window Blanking,” which is used to conceal user-defined privacy areas that cannot be viewed by an operator. Esprit HD supports up to 32 blanked window, with blanked areas appearing on the screen as a solid grey window. 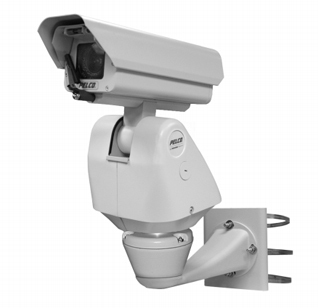 Protected Camera Optics and Electronics: A powder-coated, aluminium construction protects the Esprit HD, making it ideal for indoor and or outdoor applications. The Esprit HD also features a receiver, pan/tilt capabilities and is available with either an Integrated Optics Package (IOP) or a pressurised Integrated Optics Cartridge (IOC) in a single, easy-to-install system. The IOP can provide complete environmental protection and the pressurised IOC can shield camera optics and electronics from moisture and airborne contaminants. Within two hours after powering-up, the entire unit can de-ice and become operational starting at temperatures as low as –25°C (–13°F). Seamless Compatibility: Esprit HD supports High-Profile H.264 compression for improved image and audio quality over MPEG-4 that is 20 times more efficient than MJPEG. The positioning system features open architecture connectivity for third-party software recording solutions allowing integration into virtually any IP-based HD system. As with all Pelco IP camera solutions, Esprit HD is Endura Enabled to record, manage, configure, and view multiple live streams of video. When connected to an Endura HD network-based video security system, the positioning system has access to EnduraStor and EnduraView for optimised image quality and bandwidth efficiency. The new Esprit HD is also compatible with Digital Sentry NVs (DS NVs), full-feature video management software, which is available as a free download. DS NVs includes four free Pelco IP licenses and allows for the management of video from up to 64 cameras.